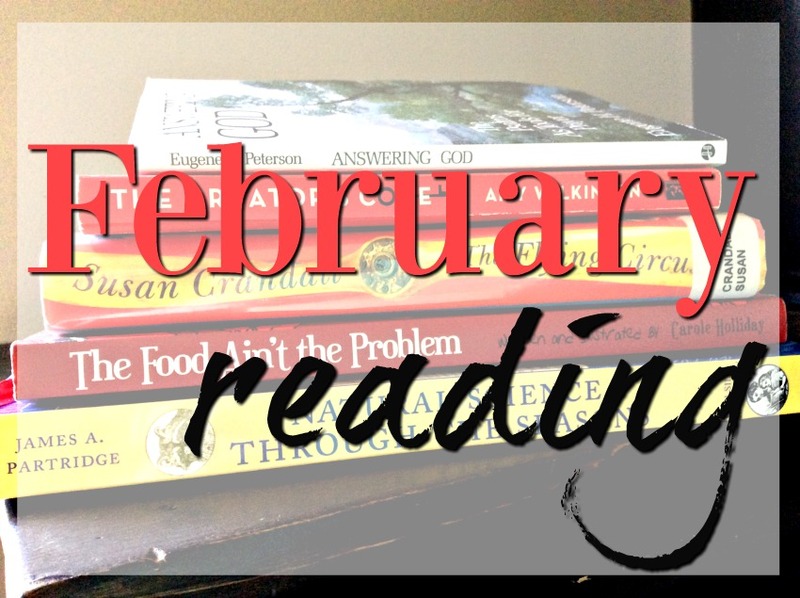 Stone Soup for Five: My reading list for February! My reading list for February! The books I'm reading this month are pretty varied, and one of my goals this year is to read five books I already own before buying another one. So far I've read The Secret Garden, Unbroken, and Jesus>religion. And, technically I bought the first book before I hit my goal of reading five, I figured it was okay since it was for a class I was teaching. Right? Definitely. So I finally buckled down and bought the book I've been wanting for years: Natural Science Through the Seasons. This book has amazing hand drawn old-fashioned calendars for each month and some great teaching notes and resources and activities. Even after I'm done teaching homeschool and co-op it's going to be a favorite for sure! I already own Anna Comstock's Handbook of Nature Study and I feel this is a great addition to supplement that book with new ideas and activities. Though I've had The Food Ain't the Problem for quite a while, I'm moving very slowly through it to take in as much as possible. I should be through with it soon, but it is definitely a keep and re-read book. Carole, the author, lost over 150 pounds and has kept it off and shares what God taught her through the process. I also follow Carole on instagram and what I really appreciate about her is that even though she is slim and fit now, she is very transparent with the struggle that she still has with food. It's helped me realize that even when I reach my goal weight, I'll probably always have this sin to battle every day/every meal, but with prayer, perseverance, and the help of God, I can make it. As I was walking in the library, The Flying Circus was on display and as soon as I saw the author's name, I picked it up and checked it out. Susan Crandall wrote one of my favorite books, Whistling Past the Graveyard, so I snatched this up without a thought. So far it's proved to be a great choice! I've had The Creator's Code almost finished for months now, but set down after a trip last fall and forgot about it. I'm going to finish it up this month. It is a great book about creative entrepreneurs and has some fascinating information that I shared with my boys to inspire them to challenge themselves (instead of default to screens and video games) and to hopefully keep them thinking creatively. And, on recommendation of my editor, I ordered Answering God from Amazon. (Busted my own commitment, again. But since it shipped with the co-op book, it almost didn't count!) I want to continue to develop my prayer life and share what I'm learning with you guys, so I thought it was a worthwhile reason to buy. I am only a few pages in, but it looks to be a great book! Let me know what you're reading and if you have any great recommendations in the comments! I have cut back my buying of books, but I can still add to my ever growing Goodreads list, right? **all links are Amazon affiliate links which help support this blog with no cost to you. Thanks! That are a lot of books for one month. Wow! You are a prolific reader. I wish I had the time to read as much as I would like. I have noted the names of a few of these to check out. Thank you.